We have already covered that God can communicate with Christians in many ways, both through General and Special Revelation. Similarly, Muslims believe that Allah has communicated with them in different ways about how he wants Muslims to act. Indirectly (General Revelation) through something that happened that can be interpreted as God talking to you. The historical teaching of the religion. The Divine Command Theory takes God’s will to be the foundation of morality. According to DCT things are morally good or bad because of God’s will or commands. This, therefore, is said to be the challenge to the Euthyphro Dilemma. Is something good because God commands it, or does God command it because it is good? Answer 1 – God has commanded something because it is good. This answer is incompatible with the DCT because something independent of God has commanded an action to be good. Therefore morality does not require God. This is called the Independence Problem. Answer 2 – Something is good because God demands it to be good. This fits in with Divine Command Theory, however it poses other problems. God Commands you only to do good. It is possible for God to command you to do something which does not seem to be good. God has his reasons for this – he has a better understanding of what is good than humans. It is an absolutist theory. This means that there is no debate or discussion on whether an action is right or wrong. The divine command theory defines an act or action as good or bad, depending on whether it supports God’s commands or not.Any act that goes against what God has commanded is classed as wrong, no matter the situation or circumstance. An absolutist approach means that the decision and outcome will always be the same. There is no ‘grey’ area when it comes to decision making. There are set guidelines and rules to follow. Emotions will not cloud judgments. Situations are all different, so need a different response. To be moral beings, then humans should make their own decisions and not simply follow instructions. The Divine Command Theory suggests that no matter how abhorrent (cruel, malicious, brutal) the commands that God may command, these acts would have to be considered ‘morally good’. The Divine Command Theory suggests that something is good because God is Good or God’s Commands are good. This is an empty religious truth or a circular argument. Something is Good because God is Good. The final problem with the Divine Command Theory is that everything is based on God’s decision. God needs no explanation and is not accountable to any other concept of morality. Christians base all of their morality on God’s personal whims. There have been many counter-arguments and solutions provided to these problems that have been suggested; as well as other schools of Christian morality. When thinking about the DCT, however, it’s important to remember that Christians believe that God is the creator of everything in the universe, this included humanity and moral conscience. Reason – Using their conscience that God gave them. Holy Scripture – This is the revealed doctrine or God’s Word. Christian Traditions – Christians may look to decisions or actions that have been made in similar situations before. We have already learned that Moral Heteronomy is when someone relies on another influence to help them make a decision. 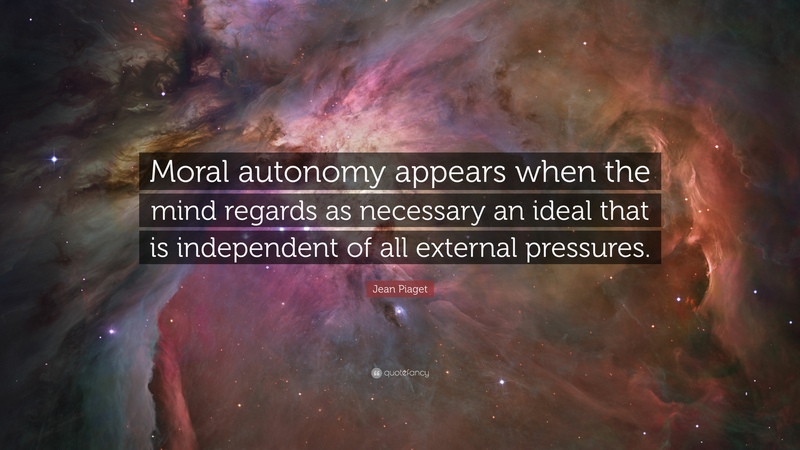 Moral Autonomy is therefore the opposite. 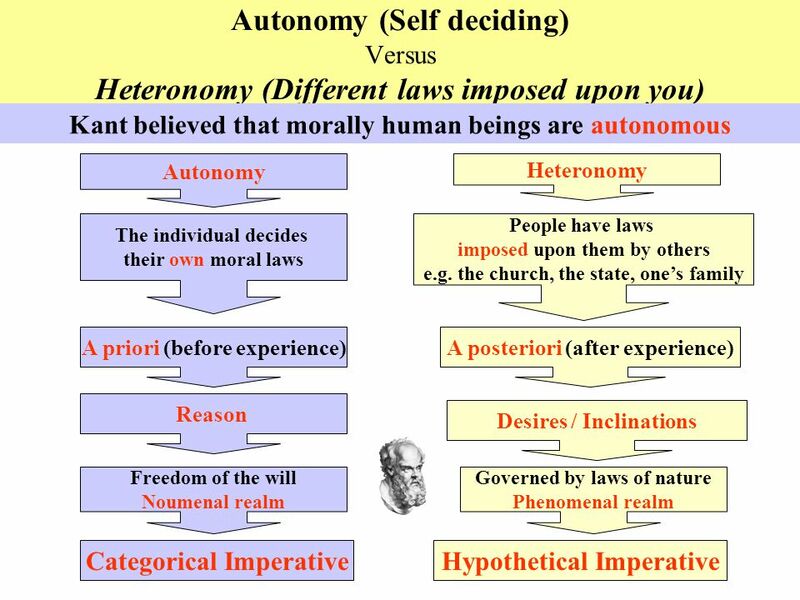 Moral Autonomy: Using reason to work out what is right and wrong and not simply following a set of rules. One gives oneself their own law.It refers to the capacity of a rational individual to make an informed, un-coerced decision. What is the most appropriate course of action to take in this situation at this time for this person? Which course of action might have the best outcome? Which course of action has the best motivation behind it? Might one choice of action produce a better outcome for the majority of people involved? Could you take general held rules into consideration in this situation? Should a moral decision be based on our interests or the interests of others involved too? Using reason to make your moral decisions is seen by many as the best way because you take as many things as possible into account and make your decision based on all the facts and being flexible about the choices you make. Others think that it’s a little too flexible and opens up right and wrong to personal whims, likes and dislikes. Kant (Kantian Ethics) is the most famous person associated with moral autonomy. He believed that humans were able to make moral decisions for themselves by applying reason (by thinking about it). They could think about how they would want others to behave if they were in the same situation. They could use their emotions, feelings, reason and personality to make a decision which would come from within. They didn’t need an external source (God?) telling them how to behave, what is good or what to avoid. ← General and Special Revelation – Types of Revelation, Strengths and Weaknesses.